When the Dodge Challenger Demon was first announced it pushed the limits of what a muscle car could be. 808bhp and 717lb.ft. from its 6.2L supercharged V8 engine, the world’s fastest production vehicle 0-60mph time, fastest-ever production car over a quarter mile, highest production car acceleration G-force and first production car to fully lift its front wheels while accelerating. It’s even 200lb lighter than the Hellcat. However, Hennessey Performance(HPE) decided that the Demon was taking up too much of the limelight. Thus they produce the Exorcist, a 2017 Chevrolet Camaro ZL1 with its LT4 V8 engine boosted to 1000 bhp and 966 lb.ft. Stats. come in around the same as the Demon with a 0-60 mph time under three seconds and a quarter mile time in less than 10 seconds. The vehicle was clearly built to directly take on the Demon, not to be just another souped up Chevy. Hints to this come from their website, with strapline is like, ‘Hennessy’s answer to the Demon’, ‘Team Hennessey’s Latest Creation is Built to Cast Out The Demon.’ You can take this as a great marketing ploy or even Hennessey’s way of saying they produce the most powerful muscle car, equally capable on the road, dragstrip or street. In any case, it’s definitely aligned both vehicles as competitors. 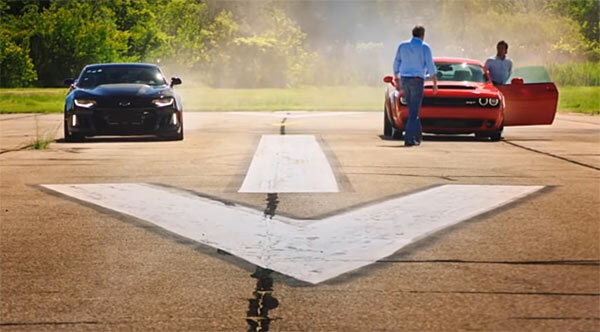 Anyways, the guys from the Grand Tour have the budget and size of film crew to put on a fully featured drag race between these two heavyweights to see which comes out on top. Like the guys or not from the Grand Tour, the video gives you a nice insight into both vehicles and what they are capable of. The race itself and the result can be taken with a pinch of salt, simply because the drivers of James May and Richard Hammond are not professional drag races. Swap out those factors and the race may have had a different outcome. No spoilers here for the results, you’ll have to watch the video, but it’s enough to say the video is a great way to check out both these monster cars and how some friendly rivalry can push the boundaries in the right direction. Find out more about the Exorcist here. Find out more about the Dodge Challenger Demon here.